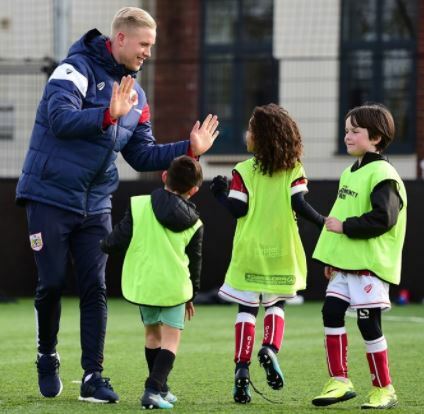 Bristol City Community Trust, who joint run the BA Sports Business and Entrepreneurship degree with UWE Bristol, will be recognised and celebrated in Parliament for their outstanding community work having been named South West Checkatrade Community Club of the Year as part of the 2018 EFL Awards. Following the exceptional work of Bristol City Community Trust, the Club will be joined alongside five other EFL regional winners at the House of Commons on Monday 12 March to receive their awards with EFL Chairman Ian Lenagan, Sports Minister Tracey Crouch host Colin Murray all confirmed to take the stage at the event. Bristol City will then be put forward alongside the five other regional winners for the 2018 Checkatrade Community Club of the Year Award, which will be announced at the EFL Awards on Sunday 15 April in central London. Bristol City in the Community impressed the judges with their Youth Council, a new group of young people that deliver practical programmes to create positive social change in their local communities. The group has so far been involved in the Bristol clean up, hosted a girls football event, developed and delivered an anti-poverty free football camp, held a free disability holiday camp, a programme to help combat Anti- Social Behaviour, developed a Mumball session and a weekly youth disability workshop. The BA Sports Business and Entrepreneurship degree, run jointly with UWE Bristol and Bristol City Community Trust, is delivered at the newly-developed Ashton Gate Stadium and is designed for those with a passion for business and want to develop an in-depth knowledge for how to build, grow and sustain a sporting organisation. Students will have the opportunity to learn from and be inspired by the real-life experiences of professionals from a wide variety of sports backgrounds, including Bristol City, Bristol Rugby, Bristol Flyers, Bristol Sport, as well as business and social entrepreneurs. For more information on studying BA Sports Business and Entrepreneurship please see here.